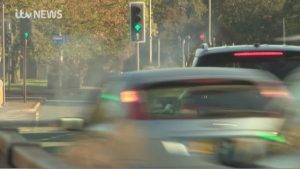 In tests done for Granada Reports, an analyst found pollution levels outside a primary school were three times the maximum limit for airborne toxins. Studies show old-style diesel engines are largely to blame. Now there are calls for Greater Manchester’s mayor to introduce a type of vehicle charging to combat the problem. Ashley Derricott has this special report.